Simon & Schuster Books for Young Readers, 9781481419321, 32pp. 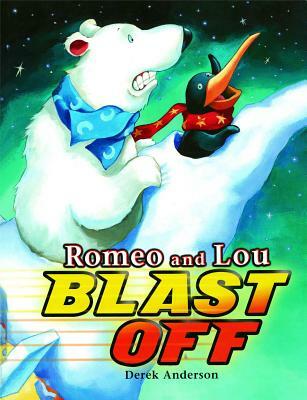 Romeo the penguin and Lou the bear are what they call polar opposites. But one snowy, blowy day they agree to build a pretend rocket ship made entirely out of snow. When a shooting star passes over the rocket ship, two best friends are carried off to a strange new world. And the real question is: How will they ever get home? Let your imagination blast off with celebrated storyteller Derek Anderson on an unforgettable winter's night journey.